We’ll start with the Australian contender, and my second read for this year’s Aussie Author Challenge is Tim Winton’s debut novel An Open Swimmer. Set in Perth and on the West Australian coast south of the capital, it focuses on Jerra, a young twenty-something who has recently dropped out of uni and is on a camping trip with his best mate Sean (note: using the word ‘friend’ in reviews of Australian books is frowned upon – ‘mate’ is the preferred expression). A chance encounter with an old bloke living near the beach (note: as above, ‘bloke’ not ‘man’) has repercussions for Jerra, for whom the trip is less of a holiday than an attempt to run away from the past. The story is divided into three parts: the first describes Jerra and Sean’s short camping trip; the second follows Jerra’s attempts to create a normal life for himself back in Perth; the third sees Jerra taking off again in the vain hope of finding some answers back where he started. It’s a short work, and if you were expecting all the answers to be set out for you by the end of it, you’ll be sadly disappointed. Winton is very adept at revealing his stories little by little, teasing the reader with half-sentences thrown away, hinting at a dark secret buried in the past (but liable to surface, rising up from the deep, at any minute). We slowly find out that Jerra’s drifting is connected with several events: a pearl found in the head of a large fish; his relationship with Sean; and a connection with Sean’s mother, Jewel. Opaque as it is though, An Open Swimmer could have its themes written ten-feet high in purple crayon in comparison with my next book. 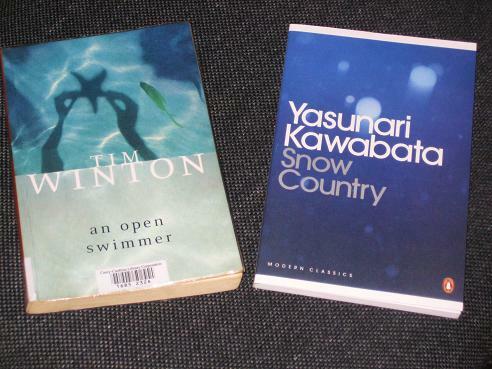 Yasunari Kawabata’s Snow Country, one of the works cited by the Nobel Prize committee in bestowing that award, is a typically beautiful piece of Japanese writing, meaning (of course) that the majority of the sub-text went floating far over my head. But I digress. Shimamura, an idle Tokyoite, takes a train journey to the mountains in the north, returning to a small village where he met the intriguing Komako, a geisha in training, earlier in the year. On the train, he sees another beautiful young woman, caring for an unwell fellow passenger, and when he arrives at his destination, he learns that the young woman (Yoko) lives in the same house as Komako. Throughout the rest of the short novel, he crosses paths with Yoko, never quite spending time together, always on the periphery of genuine communication. I’d talk more about the plot if there was one; the book consists merely of Shimamura’s two visits to the mountains (his married life in Tokyo is largely ignored…) and the time he spends there with the irascible but charming Komako. It’s all about the pictures Kawabata paints with his words, the portraits of the vivacious Komako and the reserved Yoko, the images he puts in our mind of the stark, wintry landscape – effortless and enjoyable to read. However, I feel that this one is a little too sub-textual for my liking. I felt myself constantly sensing that there was something there, something I should be getting, grasping around for some little allusion, some point the writer is making (and concealing). While part of the beauty of Japanese literature is this sense of the unstated (and understated), Snow Country was a little too much of a good thing in this regard. I was also comparing it in my mind with another Japanese book I read not long ago, Natsume Soseki’s Kusamakura, and, unfortunately, Kawabata’s book by no means came off best. Kusamakura could be a summer version of Snow Country (without geishas), and it’s a book I enjoyed more, combining the elegance of style with a disarming humour and frequent quotable bon-mots. Winton is Australia's best living writer as far as I'm concerned. He just has the magical writerly thing in spades. Have you read Dirt Music? It's set where I live now, and used to live up north. I have requested Snow Country from the library, but they only ordered it in December, so it could be months before it turns up. I like books where not a lot seems to be happening, because invariably, a lot is going on. I'm a big Winton fan. Apart from this one, I've read 'Dirt Music', 'Cloudstreet', 'Shallows', 'That Eye, The Sky' and 'The Riders' (and possibly more). 'The Riders' is my favourite – it's an utterly compelling and mindblowing book. I got 'Snow Country' for about $6 from the BD on pre-order – which is just as well as it's bloody short! Thanks for the review. I wanted to read Dirt Music by Tim Winton and something from Oe, Kawabata or Soseki. You read so many good ones. Well, mate, your review of An Open Swimmer makes it sound fantastic. I love books that pull more and more of the past into the plot as time goes on. I love the idea that he wrote it while he was in university! JoV – Comparing is easy and fun – especially when you have too many reviews and not enough time!